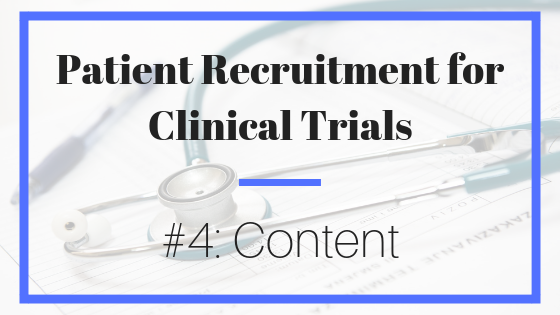 The information that you collect about your potential clinical trial participants will inform the content that you create for your recruitment outreach strategy and messaging. Strategic and well-informed content will resonate with potential patients and encourage them to take action. Through the messaging of your content, you educate the audience about clinical trials and about the patient’s role in contributing to the larger research community, while establishing the researcher and the research team as their trusted partners in the journey. All of this aids in improving the likelihood of success with your patient recruitment. A great way to pique more interest in your clinical trial is to provide plenty of information about the condition you are studying. Give a little background of the condition, list the possible symptoms, and then a brief bit about the trial itself. This will be done on the website and on social media posts. If you want to take it to the next level, write a blog post centered around the particular condition and finish it by directing people to your study. Why is it important that this study is happening now? Clinical studies that feel current or cutting edge will have more success in attracting potential participants. Find a way to tie a current aspect of life into your call for participants. It can be a connection such as a holiday, change of season, or recent news story. People who may be interested in the study will see how it directly relates to their lives and will be more likely to step forward. Never discount the power of imagery. The photos that you choose to associate with your study can draw people in or push them away. Imagery, especially of faces, humanizes a clinical trial (an otherwise intimidating or mysterious process) and makes it more welcoming. People can see themselves in that person and, therefore, imagine themselves in your trial. Remember – it is not one size fits all. Tailor your imagery to the specific study taking place. When it comes to the messaging and content of your patient recruitment efforts, choose quality over quantity. Take your time with creating a campaign and carefully choose your words and images. A well thought out campaign that is both clear and intriguing will give you the best chances of drawing in higher numbers of quality candidates. Once you have a narrative that has proven to resonate with your audience, keep it in on deck for future trials (with appropriate tweaks to keep it timely). Here comes arguably the most important part of your content strategy: tracking and analyzing. Without the proper tracking and analyzing, you essentially have no strategy or objective for your campaign. Tracking progress and analyzing results is crucial for your practice to see improvement and benefit from outreach efforts. Careful analysis will show you what content is working, what isn’t, channels in which you could improve and channels in which you are thriving. Take this information to heart and use it to make better-educated decisions with your patient-focused content. Even with the perfect outreach plan, content that is lacking in quality will get you nowhere. The goal for a successful clinical trial marketing campaign is the marriage of narrative and strategy. Find your best possible candidates by creating a story to which they can relate. When people see themselves in the condition described, they will also imagine a future in which they receive care and treatment. And your clinical trial can be the vehicle to make that happen.